Make beautifully warm percussion music with this wood tongue log drum. Strike some warm, woodsy notes with this hardwood "tongue" log drum. 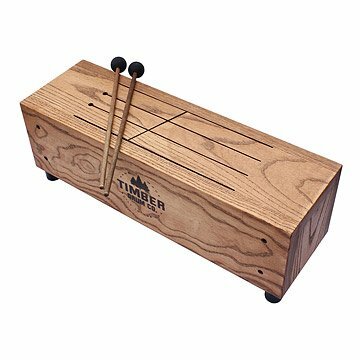 The refined descendant of a resonant hollow log, it offers foolproof percussion pleasure: strike the drum with the included rubber mallets to make six mellow tones that celebrate the timbre of timber. It's impossible to hit a wrong note! Great for drum circles and dabblers alike, this beautifully-crafted oak, ash and birch instrument is built to last. Handmade by Mitch McMichen in Nashville, Tennessee. As a teenager, Mitch's interests shifted to making music. His instrument of choice was percussion and drums. Each day after school, he spent hours playing drums. Through college, Mitch not only continued to play drums but also studied classical piano. This training and those endless hours of practice gave him the confidence to leave his hometown in Florida and attempt to "make it" in Nashville, Tennessee. While working his way up as a studio drummer, he noticed that most percussion instruments were mass produced imports with no character or individuality. So he returned to his love of woodworking and began making his own instruments - experimenting and creating new sounds. When some fellow drummers and percussionists began asking for them, too, Mitch knew he was on to something. Eventually he retired from drumming (after earning gold and platinum records for his work with country music artist Brad Paisley) in order to focus on crafting his instruments. What started in a one-car garage has now grown to a small group of dedicated craftsman specializing in these unique instruments. Interesting tidbit: their shop is located in the historical May Hosiery Mill that made the socks for the famed Apollo II astronauts. Clean wooden mantle with dry cloth. Everyone in the house loves this instrument! High quality gift that our teenage son loved! What a pleasure to hear beautiful sounds for jam sessions with friends or just playing around when the mood or impulse hits! This instrument is a quality work of wooden art a well. Just lovely! Unique piece, not a great musical instrument. Thought it would be a unique gift for my father percussionist who has everything, but it's not quite appropriate for any public performance. I ordered this on a whim for my son's 17th Birthday. He is a fairly talented musician. The sound of the drum is great, though we seem to have one area that has an issue after it has been played numerous times. I would have given this drum 5 stars, but it doesn't come with any instruction. It is a little disappointing to open it and not really know what to do with it. My son does fiddle around on, but if you aren't musically inclined, you will likely be a little disappointed. This drum has great sound and is perfect for a small space. Ordered it for the second birthday of our nephew. He loves it and everyone who came to the party had fun playing. Great present....my son really likes it!